Hello everyone on eGPU.io! I received my Sonnet box in the mail Tuesday and have been fiddling with it for the majority of the week. After a handful of OS reinstallations, I've finally gotten the issues ironed out. Hopefully you can learn from my mistakes as this is a very simple setup compared to other Macbook models. With the Mid-2012 Macbook Pros being the last generation to have upgradable RAM and HDD (and a disc drive), it is a favorite of mine for that reason alone. Having an eGPU helps take this laptop to the next level. The release of High Sierra might make eGPU setup easier, but for now I'm still running Sierra. Boot into recovery mode (Cmd+R on startup), open a terminal, run 'csrutil disable', then reboot back to macOS. More detailed instructions are in the automate-eGPU.sh guide. The script below needs to be able to detect the eGPU. Run it according to the directions. Do not use the -a flag. This option broke eGPU detection for me. Keep the eGPU connected and powered on. 6. The eGPU should now be recognized. You're done! Be sure to verify that your eGPU is showing up in System Information. Before following this guide please have your data backed up beforehand, there is plenty of room for error and any mistake might result in the loss of your data! If you have an existing Bootcamp installation of Windows (MBR/BIOS installation), forget about getting it to run. I get a black screen when booting to Windows with the eGPU on. If you wait until Windows is booted, then switch the eGPU on, the OS will not recognize the eGPU. Device Manager will not see any new devices. I have attempted to use DIY eGPU Setup 1.35, but was not able to get it to detect the eGPU. Because of these issues, I gave up using Bootcamp in favor of a clean UEFI installation, which works fine (for the most part, onboard audio is the only thing that is broken). Here's the problem with doing an UEFI install, if you have ever made a Bootcamp partition before with Boot Camp Assistant, your disk is now a hybrid MBR disk. That means when you install Windows 10 with an UEFI USB installer, it will refuse to install because the Windows installer detects the drive as MBR. For this guide, I will be removing the hybrid MBR and installing Windows 10 to the internal disk. IMPORTANT! By removing the hybrid MBR you will be rendering any Bootcamp partitions unbootable. Back up your data and say your goodbyes to your Windows install beforehand. 1.1. Download and install GPT fdisk on your macOS installation. 1.2. You will have to disable SIP if you haven't done so already for the macOS eGPU installation. 1.3. Use Disk Utility to get the device name for your disk (mine says disk1). 1.5. Type 'p' and hit ENTER to view your partitions, make sure these look familiar, otherwise you're working on the wrong disk! 1.6. Type 'x' and hit ENTER to enter the experts' menu. 1.7. Type 'n' and hit ENTER to create a protective MBR, which will get rid of the hybrid MBR. Note that there is no text confirmation. 1.8. Type 'w' and hit ENTER to write the changes to the disk. 1.9. Done. Your Bootcamp partition (if you had one) is now unusable and can be removed in Disk Utility. Partition your disk accordingly using Disk Utility so there is room for your Windows install. I used the Windows 10 Media Creation Tool to download an ISO and burned it using Rufus to a bootable USB with a GPT partition scheme. These are both Windows-only programs. I had a Windows computer available for this task. I am uncertain if Boot Camp Assistant can create a EFI bootable Windows installer. Other tools like UNetbootin and Etcher cannot create Windows installers. Since the Macbook has no network drivers installed, you should copy this .zip to your Windows installer USB for convenience. Extract the .zip and run setup.exe. 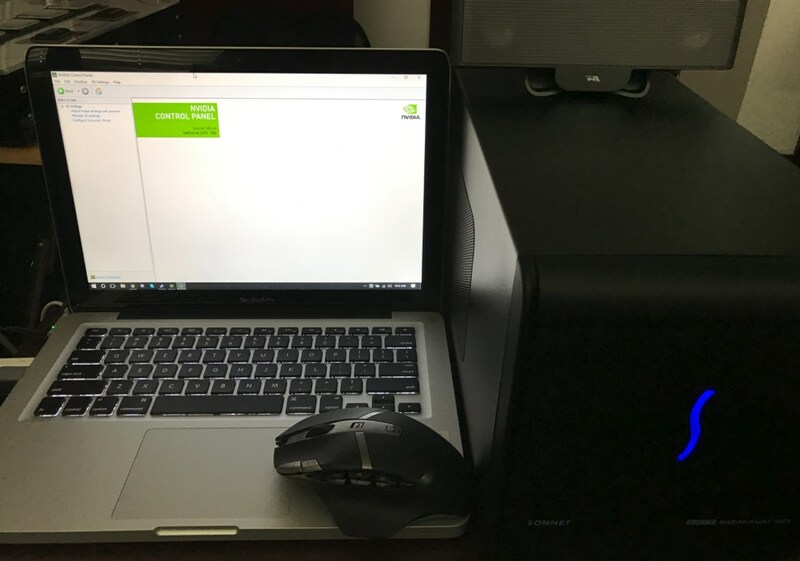 Without the Bootcamp Thunderbolt drivers, the eGPU enclosure won't be recognized. Rebooting after finishing the Bootcamp driver installation should fix that issue. Make sure your eGPU is plugged in before booting into Windows. NOTE: Audio drivers are broken in UEFI Windows installations due to a bug that doesn't occur on a CSM-BIOS install, there is currently no way around this besides using a USB audio device. Grab the latest GeForce drivers from the Nvidia website and install it. If you didn't plug in the eGPU before booting Windows, the installer can't detect the card and will refuse to proceed. The Nvidia installer required a reboot upon completion for me, your results may vary. Congratulations, your eGPU should now be visible in Device Manager. Getting programs to use the eGPU on the main display with Optimus is a hit-or-miss so far. I can't seem to force the eGPU to work when it doesn't want to. Running programs on an external monitor will get around this issue of course. PUBG actually does run with the eGPU on the Macbook display, but everything else I've tried won't. Might have to revisit this issue at some point. That concludes this guide, hope you found it useful. I have same Macbook, but use AORUS Gaming Box GTX1070. Had same issues with Win10 bootcamp. Didn't try DIY eGPU Setup 1.35. And I think it's less stable than bootcamp mode. @mirage, if your eGPU was detected in bootcamp mode (BIOS/MBR) but had error 12 or 35, then DIY eGPU Setup 1.35 can help. If not, then stick with UEFI mode as the issue here is getting the eGPU detected which is controlled by the MBP firmware. FYI: when I did a eGPU implementation on a 2012 13' MBP using a BPlus TH05 TB1 adapter (now no longer available) , I too found a difference in UEFI vs BIOS initialization and detection of a Thunderbolt eGPU. It is the same ? The Sonnet Box need an external power supply or is integrated ? only connect to mackbook pro ??? Currently , I have a GTX 1050 Ti with Akitio Thunder2 PCIe Box , Do you think this works ?? Which others grapic cards are compatible with Sonnet Box and this mac ?? I'm unable to see my node in the device manager. Thoughts? I am curious if you, or anyone for that matter, were able to get this setup to run in macOS 10.13 high sierra. Which thunderbolt 3 to thunderbolt 1 do you use? a) BIOS mode Bootcamp Windows 10 with sound, but no eGPU. I have this same laptop. There's one other option I found, which is to do an EFI install, then a DSDT override worked for me to get internal sound back. See my build link in my signature. BIOS mode Bootcamp Windows 10 with sound, but no eGPU. I am done with this crap! With this particular GPU, the GTX 780, you can do Mojave, you know that? an iMac 2011 run Mojave with eGPU is problematic as i read. I'm trying to set up my second host for a eGPU the exact same specs mid 2012 MacBook pro but am running into this strange error. Everything works well on macos side with the Vega 56. I have a second optibay data doubler. I did a clean uEFI install of windows 10 and installed the latest bootcamp assistant drivers. I have tested with a Razer Core X as well as a Apple Thunderbolt display. Plug in shut down and cold boot with no success. Odd thing to note is Sound and USB ports work through means of the Thunderbolt display but no video. I then saw your build wiped windows reinstalled and installed the older bootcamp assistant and still in device manager am getting the following "No drivers are installed for this device" under Thunderbolt tree. The sound and usb still work out of the monitor. I'm at a loss here because even if I cant get the egpu to work it still doesn't explain why video will not be sent to the apple Thunderbolt Monitor.